It was 2 weeks before Thanksgiving when Tyler, my good friend and techie-guru behind Shared Appetite, emailed me a link of a recipe he found for an adaptation of Crack Pie, with the addition of Nutella. 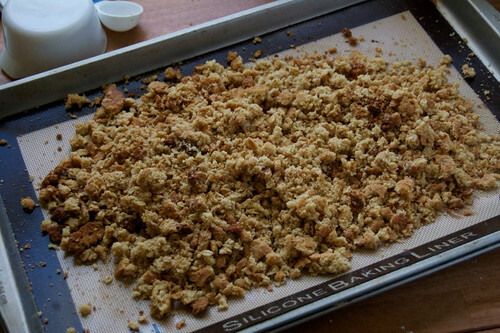 If you’ve never heard of Crack Pie, made famous byNYC’s Momofuku Milk Bar, well… I’ll get to that in a minute. Just know for now that you have been missing out, big time, if you never had the chance to try it. Crack Pie in itself is absolutely amazing. Add nutella into the mix, and I could barely hold my excitement. I immediately knew what I was going to make for Thanksgiving dessert this year. Oh heck yea. But then fast forward to a day or two before Thanksgiving. I was watching my wife eat her daily dose of animal crackers, which she enthusiastically dips into our jar of Trader Joe’s Cookie Butter (their version of the Speculoos). And it hit me… Crack Pie… with… you might want to sit down… Speculoos! Following the consumption of said pie on Thanksgiving and the subsequent days of leftover gluttony, friends and family have been asking for this recipe more than any other. And I ask, who am I to disappoint? NYC Superstar Chef David Chang has built a culinary empire around his Momofuku restaurant locations. Ramen, pork buns, fried chicken, and other of his famous offerings have earned a cult-like following. But the sweet tooth of the organization can be found at Momofuku Milk Bar: Pastry Chef and James Beard award-winning Rising Chef of the Year, Christina Tosi. One stop into Tosi’s main Milk Bar location on 13th Street and 2nd Ave, attached to Momofuku Ssäm Bar, and you’ll feel like you just entered the bakery love child of Tim Burton and Willy Wonka. Pastry Chef Christina Tosi is nothing short of a genius. Her whimsical and insanely delicious desserts have gained international stardom. Some of the most popular and best-selling desserts include her Cereal Milk Ice Cream, Compost Cookies, and this famous Crack Pie. 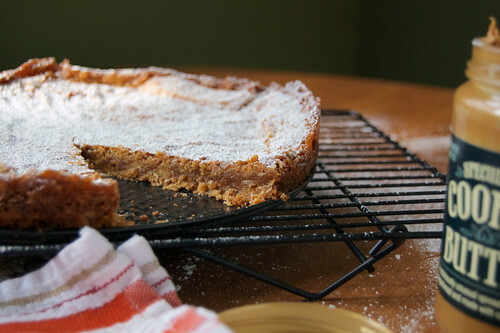 People in NY and beyond can’t seem to get enough of Crack Pie. Even at a staggering cost of $44 per pie, the demand is so high that Momofuku Milk Bar has started shipping all over the country via FedEx. They have even trademarked the Crack Pie name! But what exactly is Crack Pie, you ask? After a little elbow grease in the research department, it seems Crack Pie has its roots in an old-school Southern dessert called Chess Pie. Although I’ve never had this Chess Pie, apparently its popularity was partially due to the fact that it could be made at a moments notice with only common pantry ingredients like butter, sugar, eggs, and vanilla. An accurate taste description of Crack Pie is harder to conjure up than I imagined, but the family and friends that I have made this for have said things like: rich and gooey, has a tender chew, sweet, buttery, and salty-sweet… and then some more abstract descriptions: divine, ridiculous (in a good way), and the most popular response: absolute silence, except the sound of their fork repeatedly traveling from plate to mouth. It truly is addictive. Now, what about this whole Speculoos thing? I first had Speculoos at the NYC food truck that put Belgian Waffles back on my culinary map: Wafels & Dinges. Again, describing its taste is quite elusive. It has the look and consistency of peanut butter and it is made from slightly caramelized and finely crushed up almost-but-not-quite gingerbreadish shortbread cookies. It’s something that you just need to try. It will literally change your life. Kind of like when you first tried Nutella… but like 1,000 times better than that experience. 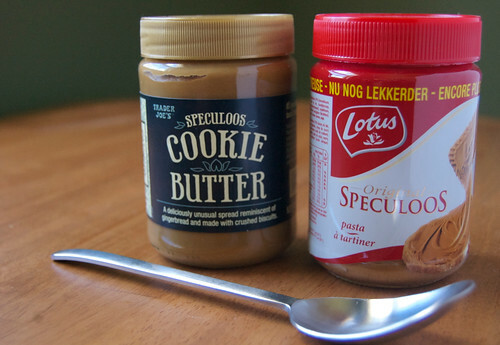 On the left is the Trader Joe’s brand of Speculoos Cookie Butter. It literally flies off the shelves from its immense popularity, so whenever I see it I tend to stock up on several jars. At only $3 and change a jar, it’s a steal. On the right is the real deal: authentic Belgian Speculoos. When Asheley and I spent a day in Brussels during our honeymoon in Paris this past July, we stopped by a local grocery market and literally cleaned them out of their supply of Speculoos. We received tons of weird looks at the checkout counter, but it was totally worth it. If you can’t find either Speculoos or Cookie Butter by you, you could always try some online shopping. It’s worth it. 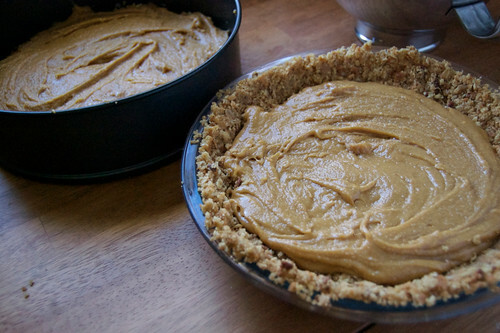 But don’t let a lack of Speculoos stop you from making Crack Pie. You can substitute peanut butter or nutella (check the recipe links at the bottom of the page for those). 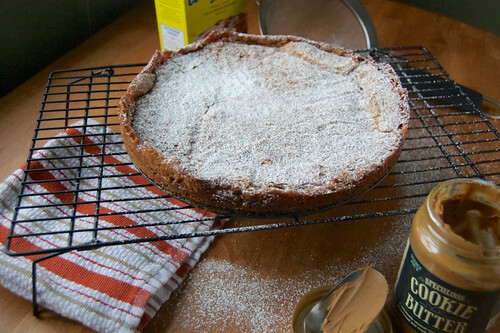 I’ve included the link for the non-Speculoos original Crack Pie version of the recipe below as well. 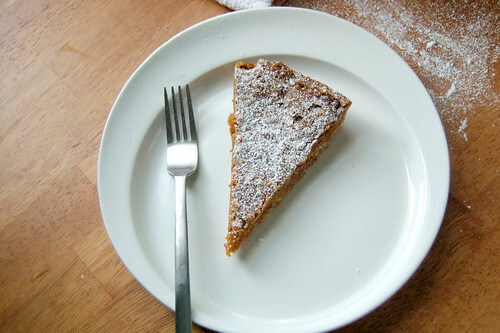 The first thing people tend to notice when eating Crack Pie is the unbelievably good crust, which is actually made from crushed-up homemade oat cookies. It’s salty-sweet, crunchy goodness. Preheat the oven to 375°F. In a medium bowl, sift together 2/3 cup plus 1 tablespoon of AP Flour, 1/8 teaspoon of each baking powder and baking soda, and a 1/4 teaspoon of salt. and then add in one egg and mix until fully incorporated. Don’t forget to scrape down the sides of the bowl with a spatula every now and again. 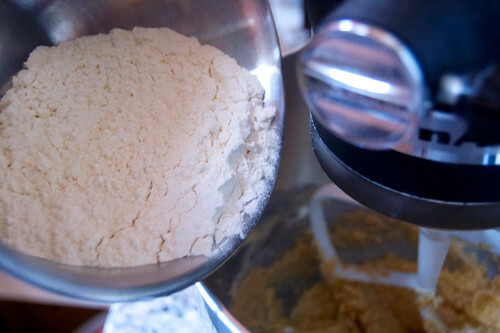 Turn your mixer to its lowest setting and while it’s running, slowly add in the flour mixture until fully combined. And then 1 cup of good ole’ fashioned oats joins the party. Mix those in on low until well blended. 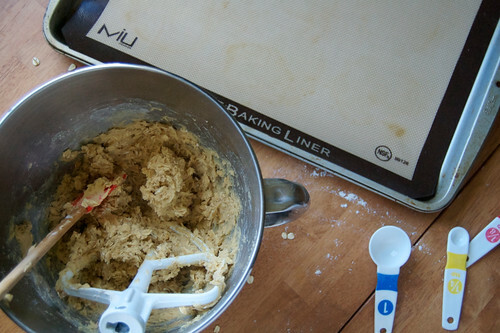 Take a large baking sheet and cover it with either a silicone baking mat or parchment paper. Spread the cookie mixture evenly on the baking sheet. 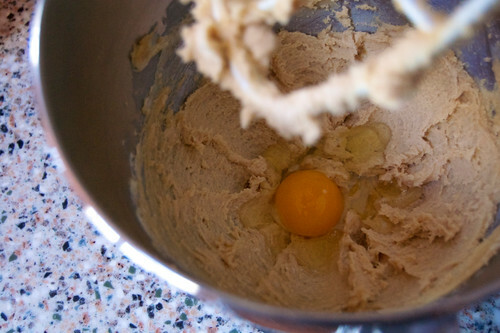 You’re about to make one giant cookie. Bake for about 20 minutes, until the top is golden brown. Remove from the oven and let the cookie hang out for a bit, until cool enough to handle. And then go to town on it, crumbling it all up! Get messy. And go ahead, take a bite or two… you know you’re going to anyway. 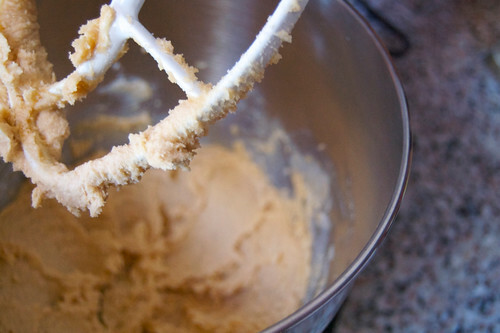 Take all that crumbled cookie, 1/4 of softened butter (1/2 stick), 1 1/2 tablespoons of brown sugar, and 1/8 teaspoon of salt and put it into a food processor. Pulse until the mixture is evenly combined. A little of the mixture clumped between your fingers should hold together. If not, add a little more butter (I typically have to add another 2 tablespoons butter). 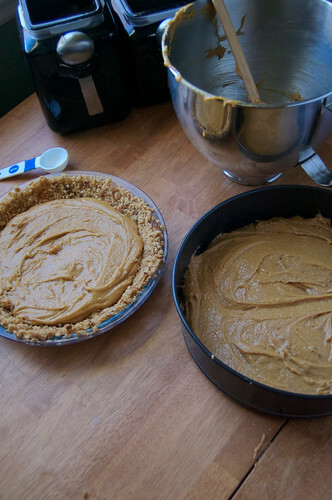 You should have enough cookie crust for two 9-inch or 10-inch pie tins. Now, I don’t make pies often, so I just used what baking vessels I had: one 9-inch pyrex pie plate and one 9-inch springform pan. The first time I made the crack pie, I used a 12-inch tart pan and that worked totally great as well, although I only got one pie out of it. Press the crust into each shell to form a thin, even layer along the bottom and sides of the tins (I just did the bottom of the springform pan and it still came out great). Pressing the crust into the pie plate is easier said than done. It’s a bit of a pain to get the crust to stay in place, but you can do it, trust me. Start with the sides first, it helps. And listen, you’re not going for a work of art here. Don’t spend too much time trying to get the edge perfect. You will go insane trying. It’s 100% rustic. Set the prepared crusts aside while you prepare the filling. Preheat the oven to 350°F. In my stand mixer bowl, I placed 1 1/2 cups sugar, 3/4 cup plus 3 tablespoons brown sugar, 1/3 nonfat dry milk, and 1/4 teaspoon salt. Mix together on low speed until well combined. 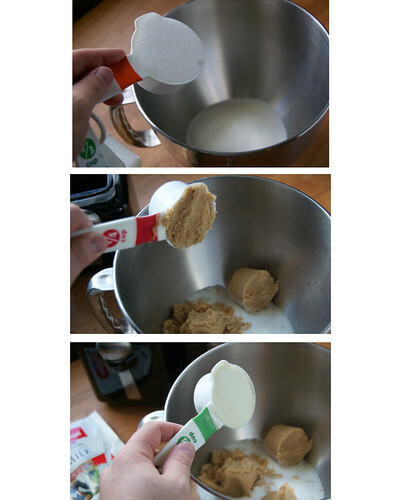 On low speed, add in 1 cup of Speculoos, 2 tablespoons softened butter, 1 teaspoon vanilla, and 1/2 cup heavy cream. If you don’t have speculoos or the Trader Joe’s version (Cookie Butter), scroll down for some different options, including the original version, peanut butter, or nutella. Add in 8 egg yolks on low speed until well combined… don’t forget to scrape down the sides of the bowl now and again. Divide the mixture between the two cookie pie crusts you have waiting. Using a spatula, carefully even out the mixture (I say carefully because sometimes the pie crust likes to get disrupted and mess up all your fun). Bake the pies for 15 minutes at 350°F. Then reduce the heat to 325°F and continue to cook for 20-25 minutes. The center should be slightly jiggly and golden brown. Remove from the oven and keeping the Crack Pies in their pans (do not remove), let completely cool and then refrigerate them until well chilled (at least 4 hours). Once they are well chilled, you can remove them from their pans. Asheley thinks they taste best the 2nd day (and the pie holds up very well in the fridge for several days), so feel free to make the Crack Pie ahead. When ready to serve, sprinkle with powdered sugar. The Original Crack Pie – published by the L.A. Times. Nutella Crack Pie or Peanut Butter Crack Pie – published by the blog Show Food Chef. 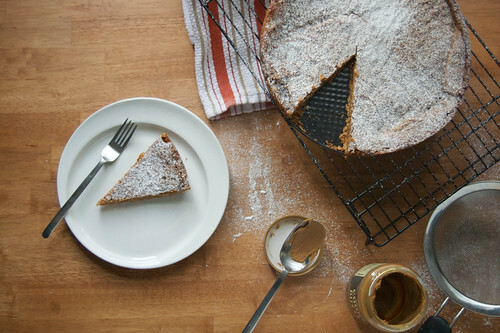 Made famous by NYC’s Momofuku Milk Bar, Crack Pie has gained an international following. Create your own fans to this insanely addicting dessert with this adaptation, including Speculoos! Preheat the oven to 375°. 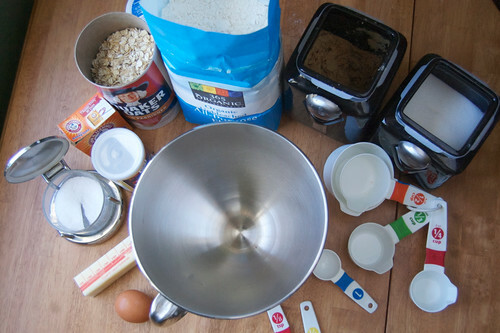 In a medium bowl, sift together the all purpose flour, baking powder, baking soda and salt. In another large bowl (I used my stand mixer bowl with paddle attachment), beat together the butter, brown sugar, and sugar until light and fluffy. On low speed, add the egg until fully incorporated, scraping down the sides with a spatula as needed. 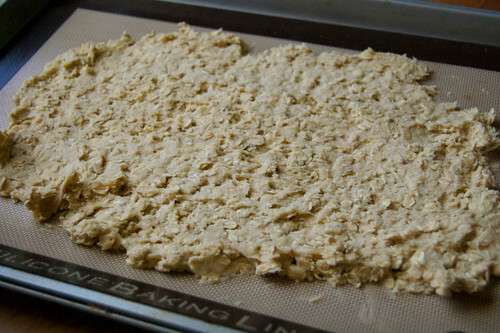 With the mixer running on low, add in the flour mixture, a little at a time, until well combined. Stir in the oats until fully incorporated. 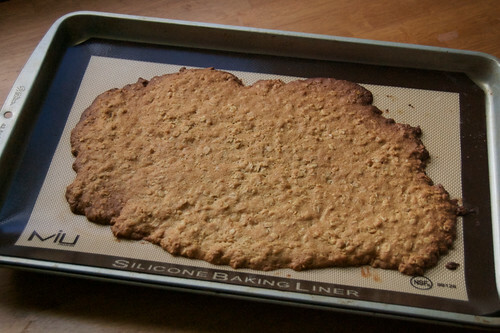 Spread the cookie batter onto a parchment-lined baking sheet (or use a silicone mat on your baking sheet) and bake until the cookie is golden brown, about 20 minutes. Remove from the oven and let cool to the touch. 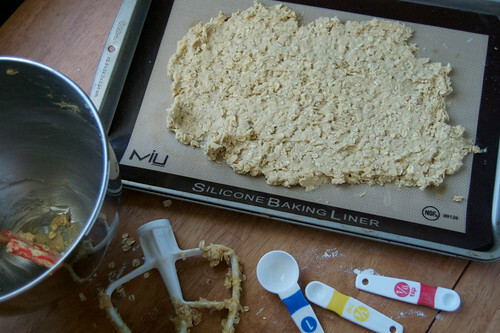 Crumble the cooled cookie to use in the crust. 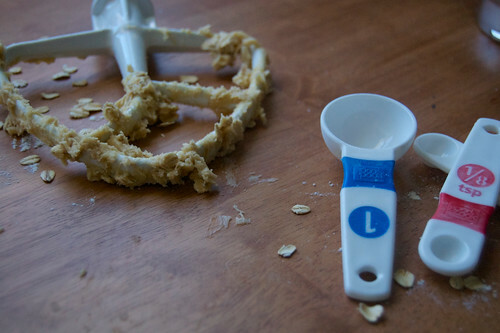 Combine the crumbled cookie, 1/2 cup butter, brown sugar, and salt in a food processor and pulse until evenly combined. When a little bit of the mixture is clumped between your fingers, it should hold together. If it doesn’t, add another 2 tablespoons of butter. Divide the crust between two 9-inch or 10-inch pie tins. Starting with the sides, press the crust into each shell to form a thin, even layer along the bottom and sides of the tins. Set the prepared crusts aside while you prepare the filling. Preheat the oven to 350°. In a large mixing bowl (again, I used the stand mixer bowl), combine together the sugar, light brown sugar, dry milk and salt. 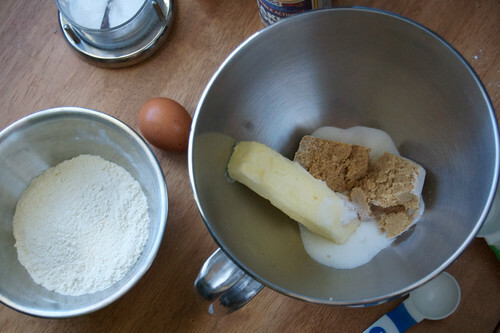 On low speed, add in the speculoos, butter, cream, and vanilla. Once fully incorporated, add the egg yolks and combine on low speed. 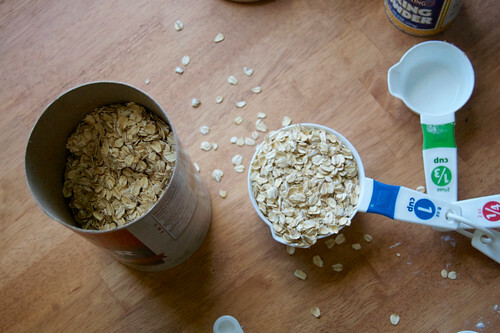 Use a spatula to scrape down the sides of the bowl and ensure mixture is evenly combined. 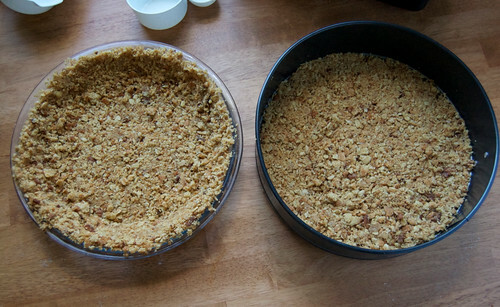 Divide the mixture between the two pie crusts and bake for 15 minutes. Reduce the temperature to 325° and bake for another 20-25 minutes, until the center is golden brown and a bit jiggly. Remove from the oven keeping the Crack Pie in their pie pans, completely cool on a baking rack and then transfer to the refrigerator until well-chilled. Once they are well-chilled, you can remove from pie pans. Can be made a day in advance. When ready to serve, sprinkle with powdered sugar. Stores well in the refrigerator for several days. Thanks for stopping by Laura! Crack Pie certainly is good enough to warrant a special mail-order! This is a good recipe but TO ANYONE WHO ISN’T A BAKER LISTEN UP!!!! When you take the pie out of the oven leave it in the pie pan. To the less experienced baker (like myself) I didn’t know that and used parchment paper in the pie pan and when i went to put it on the cooling rack and it fell apart. The average person DOESN’T know this so please next time explain yourself better. I ended up throwing it out and this recipe got me so frustrated I don’t think I will bother making it again. Hi Brandon, thank so much for the feedback. I’m sorry that the directions weren’t clear for you and I’ll update them with your suggestions. Ok so I thought I heard you talk about crack and Speculoos before….OK so I have had Chess Pie before…lots of times…in fact I make the best one around. This thing sound like nothing I have ever heard of but everything I could ever want. Once I get some crack I am definitely making this pie. Sandra, you need to get speculoos immediately! 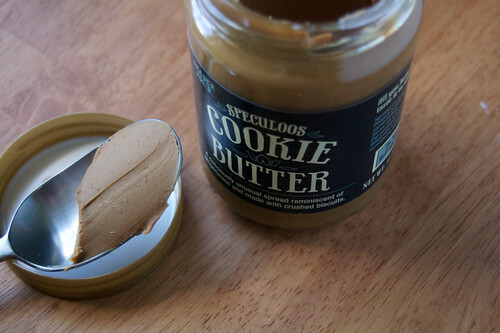 And if you can’t get speculoos, the Trader Joes’ cookie butter is amazing as well. 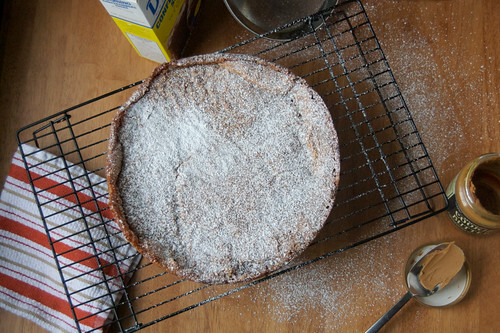 So you make the best Chess Pie around, huh? Maybe we need to have a bake-off! So I made this pie yesterday and took it to an “international dinner” evening where you are supposed to bring a dish from your own country… pretending it was a mix of traditional english (treacle tart) and belgian (speculoos) desserts. Let’s just say it’s lucky the recipe makes two pies – I made loads of friends just from people crowding around to taste it and then we ate most of the second one at home ourselves! Amazing and definitely worth all the butter/sugar guilt! Wow, you totally made my day 🙂 Thanks so much for the kind words Leonie, and I’m so glad you (and your new friends) loved the Crack Pie. And you are so right… it’s totally worth the guilt! Excited to bake this in the morning for a homeade pie contest. What type of butter do you use, salted or unsalted? Ooo, homemade pie contest! Sounds like a fun time! I always use unsalted butter, that way I can add the amount of salt I want. Good luck and have fun at the contest! 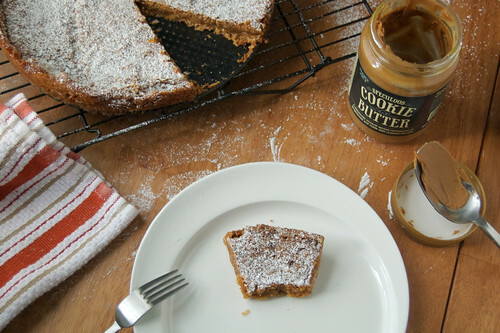 Isn’t cookie butter amazing?! So glad everyone at your party loved it! oh my god chris this is incredible!!! pinning this immediately – what a crazy awesome recipe!!! Thanks so much Christine! I really love this crack pie. It’s, well, super addicting! They sell this spread at the World Market stores…..it’s called Biscoff there. Yes, you’re totally right. Speculoos, Biscoff, and Cookie Butter (found at Trader Joe’s) is all pretty much the same thing and can be used interchangeably. Thanks! Just discovered speculoos watching cupcake wars. Cant wait to make this pie! Oh my goodness… just discovered speculoos?! Warning: you will quickly become addicted! hahaha enjoy it!!! We finally got a Trader Joes, and my mom bought me some of the cookie butter to try. Immediately, I was reminded of the Biscoff spread (which I have figured out is the same is the Speculoos). Long story short, this stuff is amazing, and I definitely can’t wait to try this recipe! Thanks so much Justin! 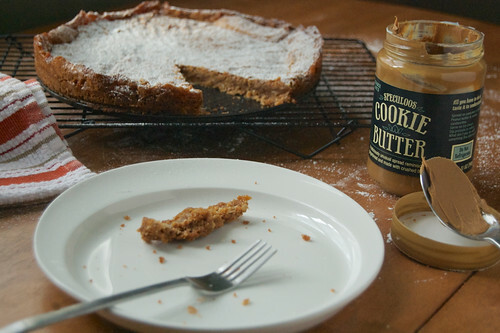 Yea, cookie butter is amazing… quite addictive!